Prima di effettuare una prenotazione, ti preghiamo di comprendere che Prudence Island potrebbe non essere la scelta migliore se hai eventi da frequentare in terraferma. Si prega di fare una richiesta prima di assicurarsi che un soggiorno su Prudence Island sia adatto per le vostre attività nella zona. Grazie! Calma, ritirato, la fuga dalla grande città ... questo è Prudence Island. La nostra casa è molto semplice, ma estremamente adeguata ad affondare in Prudenza e dimenticare la terraferma. Il nostro tasso di $ 750 a settimana è meno della metà del tasso medio per un cottage su Prudence Island, ma si avrà le stesse opportunità di sperimentare ciò che rende così speciale Prudence Island. L'isola offre un ritmo senza fretta della vita ed è come un passo indietro nel tempo. Non troverete nessun mercantilismo qui. Quando si sale a bordo del traghetto a Bristol, Rhode Island, lasciare tutto lo stress sul molo. Se stai cercando il brusio della vita della grande città di notte o l'emozione di un parco a tema, allora siete venuti nel posto sbagliato. Se siete alla ricerca di relax totale e come rinnovare il vostro spirito, Prudence Island è per voi. Newport, Rhode Island. Non ci sono motel, ristoranti o negozi, quindi intenzione di portare tutto il necessario. Se i tuoi parenti decidono di cui hanno bisogno di pop durante la vostra vacanza Isola, hanno bisogno di sapere in anticipo che non ci sono sistemazioni istantanei sull'isola. Resteranno con te, mangiare il cibo che avete portato e riducono il vostro bagno. C'è un piccolo negozio che porta alcuni elementi essenziali, ma non vi è alcuna garanzia che opereranno o aprire quando ne avete bisogno. Naturalmente, è possibile lasciare l'isola e andare alla terraferma, ma non si può decidere a.
Ci sono diversi siti web su internet per aiutare a meglio avere un'idea di prudenza e le zone interessanti intorno all'isola di visitare durante gite di un giorno. Prudence Island, La Fattoria Farnham, la prudenza Conservancy, Newport e Bristol Rhode Island sono tutte buone ricerche per iniziare. Esplorare Internet, quindi effettuare la tua prenotazione per esplorare uno dei piccoli pezzi di tutto il mondo del cielo-Prudence Island. Il cottage è il vostro cottage estivo tipico del New England con il intemperie cedro scuote. E 'piccolo e semplice, ma ha tutto il necessario per diventare un Islander per una settimana o giù di lì. Non c'è niente di speciale e può essere descritto come più di una cabina. Non c'è aria condizionata, ma le notti sono fresche e raramente anche accendere i tifosi. La proprietà si trova al culmine della Island e arriva fino alla linea di costa. C'è una camera da letto privata con un letto matrimoniale, due letti singoli nel soggiorno / sala da pranzo principale e un altro letto singolo al vetro in portico. La cucina è adeguata, completa di forno a microonde. C'è una televisione che riceve uno o due canali locali per quelli di voi che bisogno del vostro cronaca quotidiana. C'è un grill a gas, ma sarà necessario portare il proprio propano. C'è anche una nuova griglia a carbone e non può o non può essere carbone e di avviamento, quindi è meglio portare anche questo. Poiché non vi è mercantilismo, è necessario portare tutti il ​​necessario per godere il vostro soggiorno a Prudence. I forgot what day of the week it was . .
Having been to Prudence over 10 years ago, I knew what to expect - a quiet, relaxing pace with as much outdoor beauty as I could imagine. Elizabeth was a very helpful, patient & accommodating owner after I had problems making payments through the website. My dogs & I explored, relaxed, smelled the salt air & relished our time away from our usual routines & schedules. I forgot what day of the week it was - a vacation goal if ever there was one. The cottage has everything you need - a kitchen stocked abundantly with any/all utensils you could possibly ever need, plenty of beds & space to spread out, a lovely collection of books & puzzles in case you forget your own & a tv in case you need to catch the news or weather. As other reviews have indicated, the views are beyond amazing, I shot so many photos from the back porch area, including some great sunrises along the coastline. Having a washer/dryer & clothesline available is a wonderful bonus. Neighbors/relatives down the lane are lovely & shared some of their vegetables with us. Is Prudence for everyone? No, and that's a good thing, because for people who want a vacation to leave their usual lifestyle, this is a place to do it.If you need something electronic or need something other than island beauty to occupy your time, you won't be happy here. But hopefully Prudence remains as it has been, for the friendliness of everyone we encountered was beyond compare and the island itself is beautiful. I hope we are able to return next year! Thank you so much for this beautifully written review! Your words describe Prudence and Island life perfectly. 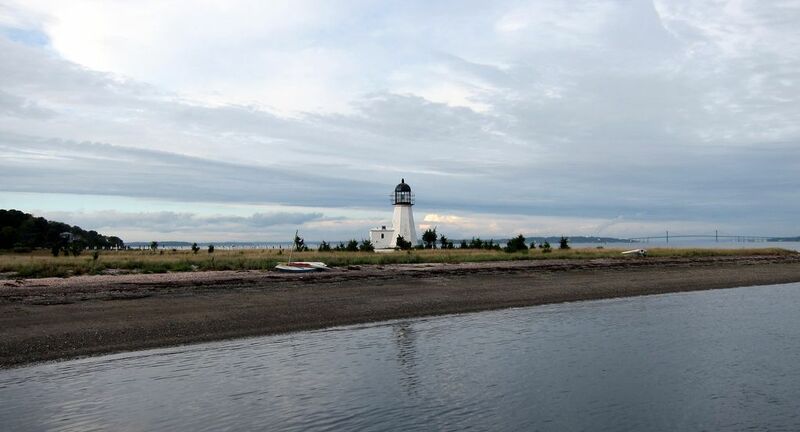 Thank you for choosing our cottage to enjoy the simplicity and beauty of Prudence Island. We would love for you to come back any time! Prudence is a perfect place to get away from it all. The house had beautiful views and is only a couple minutes walk to the beach. Elizabeth was very kind and responsive. I highly recommend this getaway to anyone looking for a relaxing vacation. Thank you for this excellent review! The view from our cottage is absolutely beautiful and I hold it in my mind until I can get back to the Island. Thank you for choosing our cottage to enjoy Prudence Island. Please come back any time! Was a great week. Beautiful view wish I didn’t have to leave! Lots of trails and beaches to keep you busy. Everyone was so friendly and went above and beyond to help my sister and I with history and directions. Only complaint is I can’t get that steamer pot on top of Frig that I just fell in love with. So glad you enjoyed your time on Prudence with your sister! Please come back anytime-the lobster/clam steamer will always be there!! I can't speak highly enough about this lovely cottage. The location was ideal-- which I had anticipated given the great reviews. Just gorgeous. What I didn't expect was how perfect the cottage is-- it has really everything you need. Very comfortable and modest enough so you feel like you are "away" from real life. Quick walk to the beach, ideal access to the extensive trail network on the island, just overall an easy vacation assuming you are willing to wake up and just enjoy the downtime without needing any outside entertainment. I also found it to be kid friendly -- nothing in the cottage that looked particularly breakable and such little traffic and such a huge yard that the kids could roam freely. Wonderful trip and we will certainly return. Thank you so much for choosing our cottage for your family's vacation and for this wonderful review! We would love to have you back anytime!! Thank you so much for choosing our cottage to feel the peacefulness of Prudence Island! We would love to have you back anytime! We had a lovely visit in Prudence Island. The house has everything you need and has an AMAZING view! The owner and the Lunds were very helpful. Prudence Island is a great place to relax. We plan on coming back. Thank you so much for choosing our cottage to enjoy Prudence Island! Most of our renters are repeat ones that have become part of our Prudence family. We would love to have you come back next year! Weekly Rate: $750 - $750 We require a $100 deposit when you make a reservation. If you choose to thoroughly clean the cottage yourself, we will return this $100 after the cottage is inspected for cleanliness and any damage. You can also opt for us to keep the $100 and use it to hire someone to clean the cottage. $125.00 per night with a minimum 3 night rental $750.00 per week-May-October We require $100.00 per week deposit to reserve your vacation. This will be held as a damage deposit to be returned after you stay. The entire rental is due within two weeks of your vacation.